The chalk horses that exist across areas of southern England are, in the main, the product of the 18th, 19th and 20th centuries. 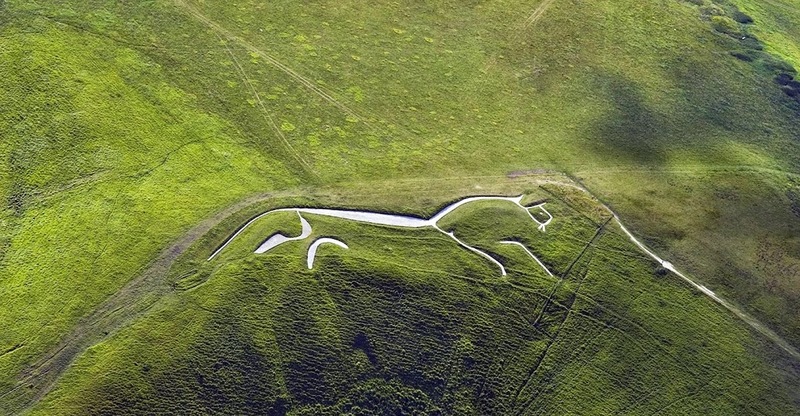 There is only one which has the evidence to support a prehistoric origin: the White Horse at Uffington (Bronze Age, approx. 1000BC), 110 metres long made of crushed chalk, close to the iron age hill fort of Uffington Castle, next to Dragon Hill where St George is said to have killed said dragon, and only a mile from Wayland’s Smithy, a Neolithic long barrow and chamber tomb, in legend the home of the Saxon smith god, Wayland (Wolund). What a landscape. What a monument. The horse straddles the hill side in a full-on gallop, stylised into its elements. 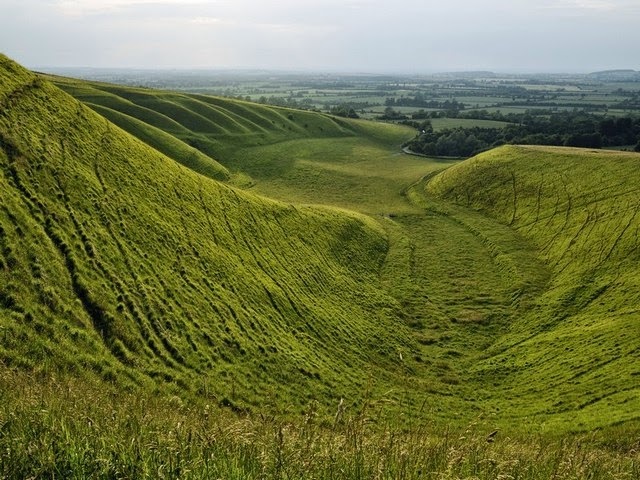 Below it, the hill falls and fans in a series of elegant waves down to a sheltered area known as ‘the Manger’. The horse is, according to most scholars, a tribal emblem and territorial indicator carved out of the chalk hillside by either the Dobunni or Atrebates tribes. And one can readily see why they wished to lay claim to this fertile and beautiful place. In a continuing cycle every seven years, the outline of the white horse must be groomed, scarified, and cleared of the encroaching vegetation. Most white horses, even those of quite recent origin, have accrued a fair or festival which coincides with the time when the work of clearance and renewal must be done. So caring for the horse was shared by people who were tied to the land, just as it is. The horse is perpetually running and perpetually still, like written words which are silent and yet speak. I have long been a slave to punctuation. The result of a good education and a few years spent as an English teacher. But there is a time to let go of what we have learnt and to embrace what we feel, and I have reached that point, at least in this very small matter. For whatever reason, this poem about the chalk horse at Uffington refused to be punctuated. Partly alarmed and partly relieved, I was glad, at least, to have someone to blame: an inspirational workshop with poet Philip Gross in February which focussed on punctuation. Yes, there was a collective sigh of despair when the topic was announced, but, with his considerable wisdom, Philip Gross explained the subterranean life of the dots and dashes we use. The marks of writing are moments of possibility, of breathing, of joining, of separation. But for me, punctuation had become more of a set of labyrinthine walls to negotiate than a place of departure or arriving. I identified the comma as my particular punctuation mark of shame. Overuse being my principal shortcoming. When I came to write about the White Horse, it soon became obvious that these words had no need of standard bits and bridles that tell the words where to start and stop. They would not be constrained in that way. The words wanted to be the White Horse, planted in its place on paper, but at the same time – free and wild.